The Philippines' second Hamilton cutter, BRP Ramon Alcaraz (PF-16), will sail through the Panama Canal during its voyage home in the first week of June. This was confirmed by Philippine Navy (PN) spokesperson Lt. Cmdr Gregory Fabic. "She will cross the Panama Canal before making port calls in the US West Coast. After those stops, BRP Ramon Alcaraz (ex-USGC Dallas) will then proceed to Guam before resuming her journey to the Philippines," he said. All in all, he said the voyage will take between 45 to 60 days. The ship is presently docked at North Charleston, South Carolina. Fabic said that BRP Ramon Alcaraz is the first ship of the PN to cross the historic waterway. South Carolina is located on the US Atlantic seaboard making it practical for BRP Ramon Alcaraz to transit through the Panama Canal to get to the Pacific on her home to the Philippines. The 82-kilometer Panama Canal connects the Atlantic Ocean (via the Caribbean Sea) to the Pacific Ocean. It cuts across the isthmus of Panama and is a key conduit for international maritime trade. Fabic also said that the ship is "fully mission capable" on her arrival. "She will be fully capable of carrying out all functions assigned to her upon her arrival," the PN spokesperson added. 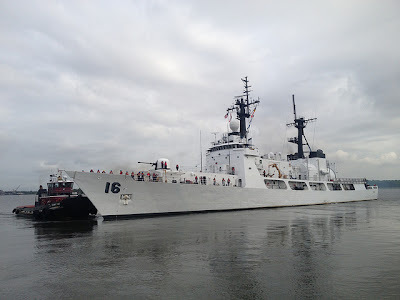 He declined to comment on what other weaponry, communications and navigation systems were fitted to BRP Ramon Alcaraz but stated that the latter is "more formidable than BRP Gregorio Del Pilar (PF-16)." Maritime observers said that this developments speak well of the PN efforts to modernize itself and boost its power projection capabilities. "With the arrival of our Hamilton-class cutters, which are being converted to frigates, the PN has started its first step in developing its blue-water capability or the ability to detect or engage intruders in the high seas," they added. At present, the PN is rated only as coastal protection naval force and nothing else. The ex-USS Dallas was a high endurance cutter commissioned in 1967 at the Avondale Shipyard in New Orleans. She was the sixth ship or boat to bear the name of Alexander J. Dallas, the Secretary of the Treasury under President James Madison (1814–1816). The ship is one of 12 Hamilton class cutters built for the US Coast Guard. It weighs 3,250 tons, has a length of 378 feet, beam of 43 feet, and draft of 15 feet. Its propulsion systems consist of two diesel engines and two gas turbine engines, giving it a top speed of 29 knots. The ship has cruising range of 14,000 miles and has a sea and loiter time of 45 days. It has a complement of 167 officers and men. The ship was originally equipped with an AN/SPS-40 air-search radar Mark 92 Fire Control System and armed with one Oto Melara Mark-75 76mm gun, Two Mark K-38 25mm machine gun system, two Mark 36 SRBOC systems, One Phalanx CIWS missile defense gun, along with multiple mounted M2HB .50 caliber machine guns and M240 7.62mm machine guns. Under PN service, all of the above-mentioned weapons and sensor systems were removed with the exception of the Oto Melara Mark-75 76-mm main gun.